Ayca Oud Wood & Rose Body Wash is a mild foaming gel cleanser that is specially formulated to gently and effectively purify the skin, leaving it soft and hydrated. Enriched with the subtle scent of Oud Wood and Rose, this skin rejuvenating body wash leaves your skin feeling soft and supple for long hours. Agarwood & Rose Oil in a Coconut Oil derived gel base with aqueous extracts of Reetha, Cinnamon & Cupressus Bark, Bay & Margosa (Neem) Leaf, Globe Thistle flowers, Glycerine & Paraben Free preservative. Explore the entire range of Shower Gels & Body Wash available on Nykaa. 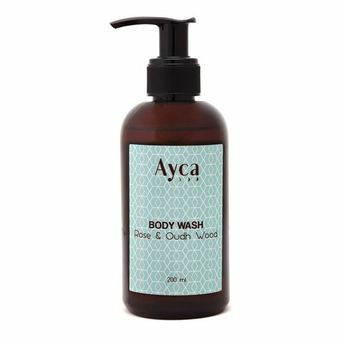 Shop more Ayca products here.You can browse through the complete world of Ayca Shower Gels & Body Wash .